Review.Network defines Institutional Investors as participants with a minimum investment of €100,000. The bonus is 25% or subject to discussion if investment is above 1,000,000 Euro. The lock-up period of the bonus tokens is 4 months. Review.Network offers a 20% bonus during the pre-sale. The minimum investment is 1 ETH with a bonus lock-up period of 3 months. 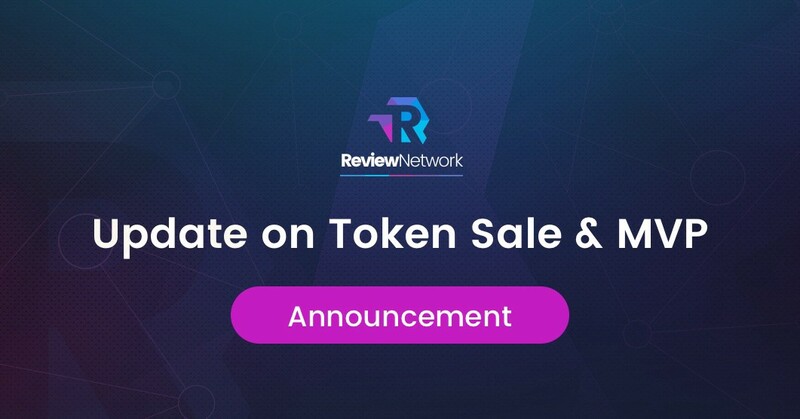 Now more than ever, we are certain that Review.Network will be a transformative force in the commercial market, as we are hitting our development milestones, expanding marketing efforts and seeing the world react to our vision and our product. Review.Network will release the ‘User MVP mobile application’ on the Google Play store and as an app on August 26th. This app will allow users to answer surveys as well as write and browse reviews. The Company ‘MVP web application’ will be released on September 1st. This application will allow companies to create surveys and see live results of the answers provided by users. The new design of the ‘Beta User App’ will be published in the coming days. The Beta version of the platform will be released before the end of 2018. Since we began working on Review.Network, our team has grown quite a bit as we have been onboarding experts across many fields that share our vision and will play an important role in bringing Review.Network to life. One of our latest additions to the team is Christoph Irmer, former Chairman of the German Association for Online Research (DGOF). Christoph is a successful entrepreneur and an expert in the market research field with over 15 years of industry experience. He’s now working with Review.Network to bring forward the next generation of market research tools and techniques. Our world tour introducing our project began in Dubai back in April, where we presented the first version of the Review.Network MVP application for users. Since then, we’ve visited more than 30 other conferences in more countries than we can remember as we continue to work on the development of our software. We are now incredibly excited as we are close to releasing the improved version of the ‘User MVP’ to the public for the first time. We are also incredibly close to releasing the ‘Company MVP web application’ publicly scheduled for September 1st, one week following the ‘User MVP’ release. Currently, we stand at over 100,000 Beta user sign-ups, and can’t wait to get started with the launch of the Beta platform in December. Another important step was partnering with PayXpert, a global payment processing company, which will help us push Review.Network to mainstream adoption, as we implement integrated market research experiences for PayXpert’s client base on their points of sale, allowing them to gather real feedback from customers immediately after items are purchased. We also recently announced an agreement with the Bancor Network to integrate their protocol after the public sale, which will allow for amazing real world use cases and interoperability of the REW token.